Designed by Faisal Yamin and built to perfection by Les Voorhies the Claymore is a robust, tactical, every day carry folder with a truly custom style. Built on a beefy titanium liner frame the Claymore has a smooth operating CPM-S35VN blade executed in a hollow ground, recurve profile. 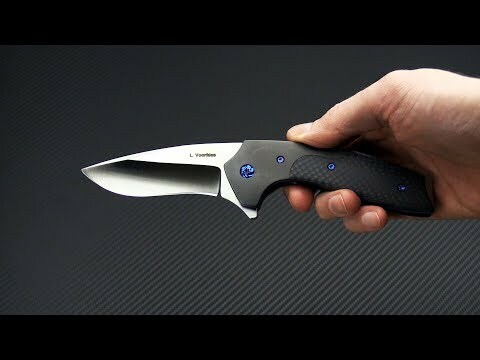 This version comes with Zirconium bolsters, Carbon Fiber scales and blue anodized titanium liners and hardware. Brand new direct from Les Voorhies. Blade: The sub-3.5 inch, S35VN blade is robust at the spine with a hollow ground recurve profile that offers powerful slicing performance. A long top swedge tapers the spine to a fine tip for piercing and a ball bearing pivot offers fast, smooth deployment via the generous flipper tab. The two-tone satin finish showcases the custom nature of this piece. Handle: The Claymore starts with 2mm thick titanium liners, one of which forms the rock solid lock. A custom, titanium Torx pivot and screws attach the sweeping Zirconium bolsters and handsome Carbon Fiber scales to the simple, ergonomic handle. Both the titanium liners and hardware, including the clip, have been anodized blue for a pop of color. The flipper tab doubles as an index finger guard and a fin-like stainless steel backspacer protects the blade and has an exposed, striker pommel end. Includes a microfiber baggie and signed/dated card from Mr Les Voorhies. Carries via a right hand, tip-up, 3D machined titanium pocket clip.